The West Berkshire Energy Switch is a scheme where residents can sign up to see if they can receive cheaper energy tariffs. Many people are paying too much for their gas and electricity and haven't changed suppliers in years, if at all. 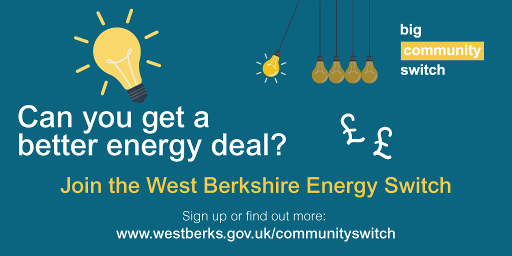 Join the West Berkshire Energy Switch scheme today to see if you can secure a better energy deal for the year ahead. Over 2,250 households across West Berkshire have previously registered through this scheme. In the last scheme residents who signed up were able to save an average of £132 per year by switching supplier. Taking part in the West Berkshire Energy Switch is free and without obligation. The more people that participate in the scheme, the more likely we will be able to get a better deal for you. We have partnered with independent experts in group buying, iChoosr UK. iChoosr manage the reverse auction and switching process, as well as provide support for residents at every step of the way. Before the auction you need to register with your address and energy details. You will need to have your annual energy statement, or most recent set of bills to hand as these will show your current energy usage. On auction day a reverse auction is held where suppliers compete to provide the best deal. The lowest price wins the auction. After the winning supplier is announced you will be sent a personalised offer with their winning tariff. Once you have received your personal offer, you will have until the end of the acceptance period to decide if you would like to switch or not. iChoosr also have some frequently asked questions on their website.